Even though this is not a fantasy novel, it has been sent for review for these pages because Gallagher has sci-fi/fantasy experience within his writing: Stephen Gallagher is probably best known as a television screenwriter (including two episodes of Doctor Who in the 1980s: “Warrior’s Gate” (1981) and “Terminus” (1983)) and this wealth of experience tells in his writing: he creates a sense of time and place with no discernable effort, his dialogue is excellent, and his description subtle but accurate, weaving a world which completely immerses the reader. An undercurrent of intelligent humour, and words of wisdom which leap randomly from the page, further enrich the narrative. This novel is the third to feature Sebastian Becker, a “Special Investigator to the Lord Chancellor’s Visitor in Lunacy”. In layman’s terms, Becker is employed by the British civil service to investigate cases of suspected lunacy amongst the rich and landed to prevent their wealth being mis-spent. He works out of Bethlem (‘Bedlam’) hospital but his investigations take him far beyond those walls. Becker is, in many ways, clichéd for a detective – a loner, the voice of reason amongst extremists, hard-working and with a strong sense of justice – but this does not detract from the success of the story. Subtle details, such as the relationships with his sister-in-law and his son Robert, make sure this is an above-average detective yarn. 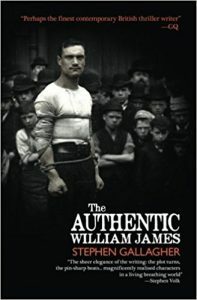 The case of William James starts with a theatre fire which kills over 50 people; Becker is asked to find James, who has gone missing, and make him a scapegoat for the tragedy (guilt or innocence irrelevant). He is instructed to prove James to be sane so that he can be hanged without delay. James’ capture and execution are intended to create a smokescreen, behind which lies a potential political scandal. 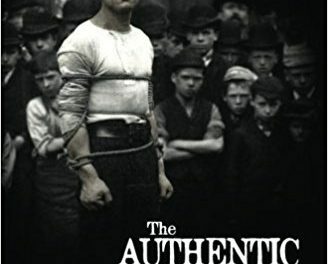 True to his character, Becker struggles with this assignment and soon finds himself emotionally involved with the James’ world of carnivals, travelling people, and itinerant Wild West shows. The Authentic Williams James is a story which covers a lot of ground geographically: the story takes us from London and Sussex, to Pennsylvania, California, Philadelphia and Wyoming. Set in 1913, this is a fin de siècle novel: cars co-exist with horse drawn carriages; travelling side shows compete with the movies; medicine is making huge advances but can still be brutal. Despite this huge scope and volume of detail, the story moves swiftly and engagingly across the pages. All the principal characters are sensitively well-drawn; I am particularly fond of Frances (Becker’s sister in law, who fulfils a Dr Watson role) who “[is] one of life’s accompanists, seeking no audience of her own”. The villain is particularly repellent, creating poison and danger around him – he is an awesome adversary for Sebastian Becker (and for James) who haunts the pages even when he’s not on them. As a lover of detective fiction, I am grateful to the BFS (and Jonny Lee Miller) for introducing me to Sebastian Becker – I am looking forward to reading his other adventures very soon!